Students learn best when they take ownership in the learning process and are actively engaged along each stage of the learning process. While our current educational technologies do a good job of presenting information that needs to be passed on to learners, it does not necessarily do a good job helping students increase their level of engagement. Teaching techniques and learning technologies will best serve these students when engagement is supported and encouraged in every stage of the learning process. This culminates in a pedagogy is often referred to as “Engaged Learning.” Using a pedagogy of Engaged Learning means being mindful of the barriers to engagement and scaffolding learning exercises in a way that maximizes engagement opportunities. With the development of knowledge and technology being a necessity for the good of our society and the individuals within it, we have built substantial systems of education to further the process. A Learning Management System (LMS) may be best defined as an online software platform used for the dissemination of educational materials or facilitation of teaching and learning. While many software platforms can be used to facilitate learning, we generally reserve this title for systems that are able to provide a comprehensive suite of tools for instruction and evaluation of student learning. It is important for teachers and technology designers to understand the pedagogy of Engaged Learning so that they can create environments where students will learn best. If online software simply mimics the traditional classroom structure, students may fall into a passive mindset. What’s worse, there will be no physical interaction where the teacher can see that the students are not engaged. While electronic technologies offer a clean slate and software can be written to facilitate many different kinds of interactions, we have seen Learning Management Systems gravitate towards the traditional classroom model. Knowledge is still treated as something that is being dispensed from a central source, rather than built by participating learners. The problem becomes that often instructors – and far more often administrators – look for a “silver bullet” LMS that will miraculously provide students with the tools they need to gain knowledge. The truth is that technology, instruction, and learners all need to be taken into account if we are to facilitate knowledge building. That is why I have proposed we look at technology selection as part of a Model of Engaged Online Learning. The Model of Engaged Online Learning shows that there are three interrelated factors that impact a situation of learning that utilizes online tools. First, there is the design and affordances of the LMS platform. While the LMS will never be completely deterministic of how instructors and learners interact in an online community, it can set a groove that will provide the path of least resistance when it comes to course design and learner interactions. Second, there is the pedagogical philosophy and course design. This will certainly be impacted by the LMS design and the groove that it sets but there are still many ways that an instructor can determine how a course will run within the framework the LMS platform provides. Finally, there is the factor of learner characteristics and motivations. Even more so than instructors, students seem interested in supplementing and subverting learning systems to interact with the class in the way they feel is best. 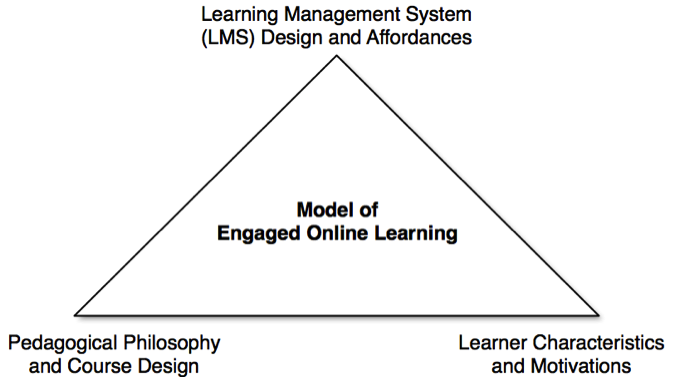 When looking at the Model of Engaged Online Learning it is important to see how the three factors relate to each other. Each factor is important and necessary for the model to work. Without an LMS platform, pedagogical design, or learner interaction it would not be possible for an online learning community to exist. Also, each factor relates to each other and influences their development. But at the end of the day they are not determinant of each other and hold commensurate influence over the model as a whole.